When putting together some flower containers this year, ended up with lots of log growing and intermediate height plants but didn't get much for vertical interest. Decided to put some of my sea oats from the ground and use them in two containers at the entry on the front porch. 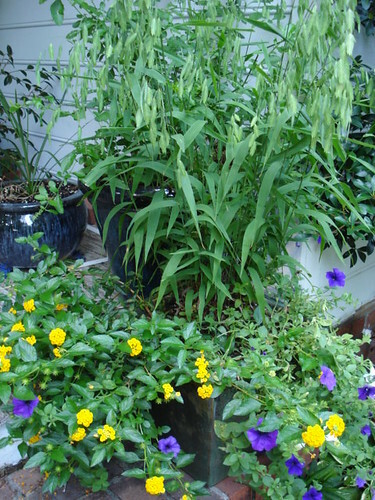 IMO they turned out very well and complement this medium large square container with the sea oats, lantana, and wave petunias. Yes I agree. I was told when shopping for containers to look for three things: tall and spikey, low growing and trailing, and bushy plants. your containers make a good example.